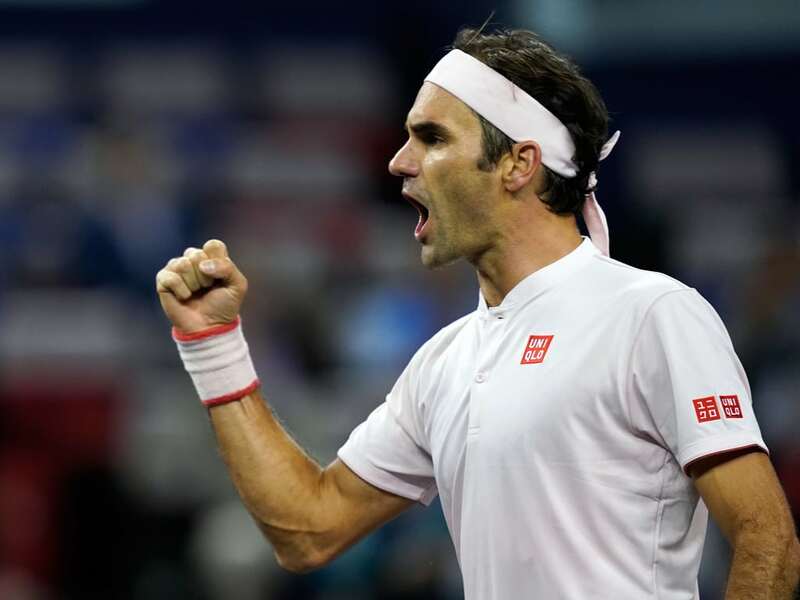 Roger Federer's Shanghai title defence bid is off to a winning start after the Swiss survived a tough encounter against Daniil Medvedev, eventually prevailing 6-4, 4-6, 6-4 in 1 hour and 52 minutes. The Russian came into the tie brimming with confidence having just won his third and biggest title of 2018 at the Tokyo Open and after a nervy start, he settled nicely to give Roger a real workout from the back of the court. Roger won the toss and elected to receive. A nervy-looking Medvedev double-faulted on the opening point and the Swiss went on to break for 1-0. The advantage was quickly consolidated to 15 but in game four, some loose points handed Medvedev the break back. The Russian soon found himself up 3-2 and very much in the driving seat. In game seven Roger came out on the wrong side of a 29 shot rally and missed a breakpoint a chance but he was able to take in the initiative in game nine, again helped in part by a Medvedev double fault en route to breaking for 5-4 before taking the set 6-4. Into set two and Medvedev fought off a break point in game three and from there both players traded comfortable holds. That run ended in game ten however as Roger couldn't serve to stay in the set as Medvedev nabbed it 6-4 with solid hitting from the baseline. 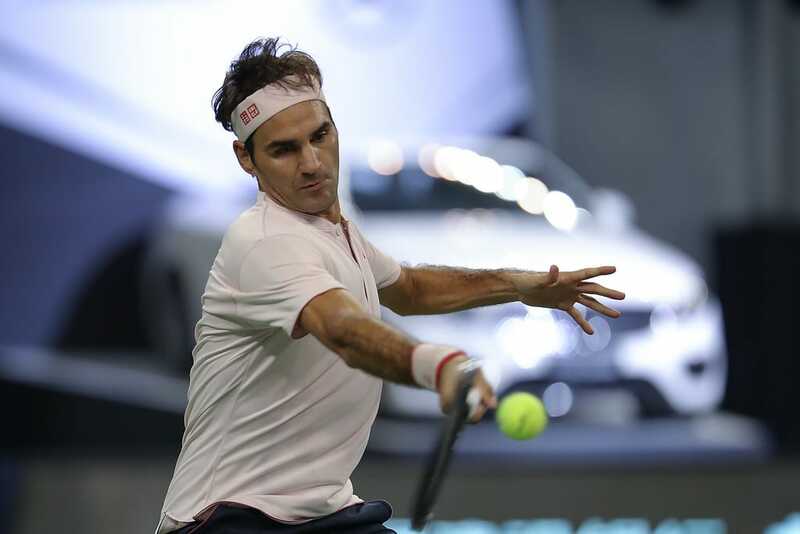 With Roger holding a 7/11 record for the year in third set deciders he was the slight favourite heading in but he had to dig deep, coming up with a superb half-volley at 15-30 in game two and then saving a breakpoint. In game three it was Medvedev's turn to save a breakpoint, aided by a huge Federer shank as he held for 2-1. From there both players exchanged easy enough holds but after holding from deuce in game eight Roger made a move, applying the pressure at 30-30 and getting the crucial break when Medvedev's forehand broke down. The Swiss served out the match 6-4 with an ace on match point. Good fight. The crowd was unbelievable. I had to play some great tennis at the end which made the difference. I tried a bit of everything and I'm happy because it actually did work. A tough start here for the GOAT against a guy who's enjoying a stellar season and was on a 7 match winning streak from Tokyo last week. The only real time I've seen Medvedev play was when he took out Stan at Wimbledon last year and he was impressive. Rock solid backhand that's very flat, an effective serve, good mover and an unorthodox forehand that appears to tricky to read. He certainly brought all those things to the court today and he's also improved over the last 12 months so he was a real handful. After Roger went up the early break it looked like it might have been a short evenings work but Medvedev reined him in and from the back of the court was the more solid player for the most part. Fortunately Fed's variety and net game got him out of some sticky situations. Medvedev probably hit the volley of the match as you can see in the video above but Fed came up with some of his own volley magic, especially that half-volley at the start of set three to avoid two break points. He also mixed it up a ton, it didn't always work as Medvedev was able to soak up a lot of it but Roger kept trying things and got his rewards in the end. I also think holes in your technique are going to be exploited more on the big points and Medvedev's forehand is one of the wackiest around. It held up for basically the whole match as he'd managed it well with Roger targetting it but it leaked errors at the end of the first set and third set in the games he was broken. Next up is the Royal Bank of Agut who had a tough three-setter with Mackie McDonald earlier in the day. Agut has had a few injuries of late and hasn't looked in great form judging from his results but he's a real roadrunner and will make a lot of balls so this could be another test. I've not seen him play here in Shanghai to really judge his level but he usually gives Fed a bit of a game before losing too many of the crucial points. His backhand is a bit of a hockey shot and there's no real artillery in his game so I'll pick Fed in two sets in what I assume will be slightly quicker conditions. Decent win against an in-form player who made life very difficult for out there. 3rd ! Two crunched nails at least again !! So what? Things and people change all the time, so the odds are that way more often than not things and people are not what they used to be. That said, I didn’t watch the match and I’m yet to watch the highlights, but credit must be paid where it is due. The guy on the other side of the net is not grandmother on a wheel chair. He’s a top athlete. So, eat you porridge, kids, and enjoy it. Medvedev is a 3 title winner in 2018 and moving up the rankings, so not a surprise it was competitive. But closer than I expected. Exactly,there are so many armchair warriors out there who have never even stepped on a tennis court,still less won a match on one.And at this level ,playing the best in the world,nearly all of whom are years younger than him! Love the last two sentences., Rui, thanks for the laugh. That match was too close for comfort. Thank goodness for Fed’s serve and net play. I agree, though, that Roger should win over RBA more comfortably, as long as he plays at a decent level. Yeah closer than I prob expected but tbh it’s no surprise that a guy who just bagged a 500 title runs him close. Although I did wonder if he’d be emotionally and physically tired. He looked tired in his face at the end but commies said he’s known as a tough competitor. him at all he played really well and looked shattered by the end. As for BA,I would go for Fed in straights,no real weapons to hurt Fed. This win should have given Fed much needed confidence.A loss today would have been disastrous,not only in ranking points but also match practice.So upwards and onwards.? All of these comments Annie, including going for a walk around the garden. I thought Fed was courageous to go to the net so often as there were a few unpleasant passing shots. I actually thought Fed played very well and he was playing the winner of the Tokyo Open who was young and on fire. People expect so much of him, too much, they expect him to win every point (although I am one of them, haha! Has anyone had a heart attack watching Federer?). Loved the red contingent with their huge Fed banners covering several seat rows and themselves. Yes, if he had lost it would have been a disaster for him and us but he didn’t so “Come on!! !! !” tomorrow. Yes,it is the courage isn’t it?Anyone can stay at the back of the court ,trading shots,waiting for the more aggressive player to make mistakes.I think you know who I mean?So he did well,especially as the first competive match since American Open. So I think he will go forward with increasing confidence. Also this what I like about Tsipas,he also trusts himself and makes things happen.So we shall see. Yeah I expected Medvedev to wilt after dropping the opener given the amount of tennis he played but he was deffo there to compete. I thought he looked dead at the end too, zapped of energy in his face. That volley is just stunning. How Medvedev managed to put that spin on it when it looked as though he barely reached the ball I don’t know! Yes it was wasn’t it.Very rare for Fed to applaud an opponent,but he did then.Not suggesting that Fed is mean with compliments but it it is quite unusual. I thought the spin was almost an accidental function of his barely getting to the ball- jabbing to BAREly reach it, the whipping around to be ready in case it came back… I imagine it would be difficult to re-create that on purpose. Well it was slightly fluke tbh, great shot to make it but never intended to hit it that acute or with that much spin. The fact he got enough on it at full stretch off a dipping pass though is quality. Very close match as expected. Roger comes through thanks to his great volleying, variety and experience. Also thanks in part to Medvedev’s FH at crucial points and his horrible ball toss :). RBA should be easier as they have played a few times before and Roger knows what he needs to do. Of late, I think Roger’s play during crucial points tends to break down even against run of the Millmen. He leaks errors at the worst possible times and starts doubting himself even when he is ahead. Hopefully that is my imagination and not just a sign of Roger getting old coupled with lack of enough match play. That Millman match was a bit unusual as Fed said that he couldn’t breathe!All of us doubt ourselves at times,but grand slam winners usually back themselves to win,errors or not. Very good start from Fed, especially when considering this very tough first opponent in his draw. He look rested and I liked his courageous attacking style. I don’t think using his slice is unnecessary. Quick to write off a shot that won him like 10 slams when paired with his forehand. All about mixing it up and keeping that attacking mindset, aggressive slice and aggressive topspin. Both good choices. You’re right of course. I have no problem with Feds bh slice. Its amazing to mix up his game. My point is he used it far too often this year being just so much passive (preventing to loose using the slice instead of trying to win using the topspin). but and there is always a but I always think the pressure to please must be tremendous. we expect too much having said that I just want him to win! Yeah half the crowd were there for Fed and Fed only yesterday. Yeah second serve got attacked a lot, was winning like 20% at one stage in the second set. Good title….Fright Night. Boy Roger, so many nail biters this year. I had visions of Mirka hauling out the suitcases. Good win and he played well considering. Shanghai….what a zoo. How many body guards around Fed, 12? The fans are crazed. Reminds me of old footage in a documentary of the Beatles at Shea Stadium 1964 or so. Girls screaming. So much devotion, wow. Kind of creepy. Next match, 3am for me. Good luck, Roger! They are mental over there for him, not sure I would wanna sit amongst the big contingent in red. Could be too much. Oh, and don’t forget to vote for Fan Favourite!!!! Medvedev is only 22, so 15 years younger than Roger… Also did Mededev grow a lot this year? I only saw him before at the Next Gen Finals when he lost to Chung but he looks much taller now. Think he’s always been pretty gangly but I haven’t seen many of his matches to really know. Medvedev will go far in career it seems. Also he seems to be a nice guy. I think Roger likes him? Yes,I thought he could be rather unpleasant.The time he famously told Tsitsy to’shut the phuck up’ for example. Ugh. Tell me, folks, was Roger struggling like this in the early rounds of AO17? Yes I think he had two tricky first matches.But that second set today was awful especially following the wonderful first set.